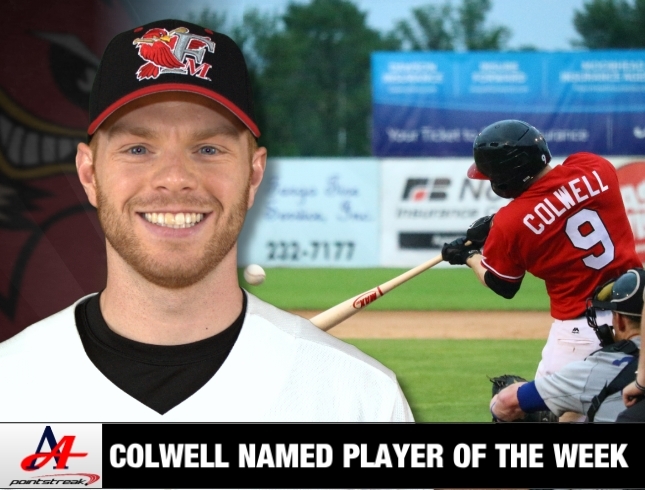 07/09/2018 1:00 PM - FARGO, N.D.  The American Association of Independent Professional Baseball and Pointstreak announced RedHawks outfielder Tim Colwell as the AA Player of the Week, for the week ending July 8, 2018. The Shoreview, MN native and former North Dakota State University outfielder went 14-34 last week with nine runs, four RBIs, six doubles, two triples and five stolen bases and is now batting .346 on the year. Colwell began his professional career with the Sioux City Explorers in 2014 after becoming NDSUs career leader in triples (18), hits (291), stolen bases (52), stolen base attempts (68), at-bats (830), runs scored (172), and games played (211). Colwell hit .307 in his inaugural professional season and played two more seasons with the Explorers before moving on to the St. Paul Saints in 2017. Colwell came to the Fargo-Moorhead RedHawks this season, returning to the same field he played his college home games at, Newman Outdoor Field. The RedHawks are on a four-game winning streak and sit atop the Northern Division for the first time this season, with a half-game lead over St. Paul. Tonight, begins the first of a three-game series in Wichita, with the first pitch scheduled for 7:05pm.